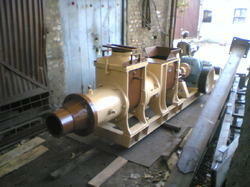 Our organization is engaged in manufacturing and supplying a comprehensive array of De Airing Pugmill. The competent team of professionals hired by us fabricate these machines in accordance with the industry laid norms and guidelines. We offer this range in various specifications such as output capacity, dimensions and speed to cater to the varied requirements of the clients. Available machines are specifically tested on various parameters of quality to ensure their flawlessness. Our experts ensure timely delivery of these products to acquire maximum satisfaction of the clients. The DE-AIRING PUG MILL machine is widely used for Shaping, Pugging and Extruding of ceramic clay by plastic process where De-Airing is necessary. It consists of three chambers in one line. 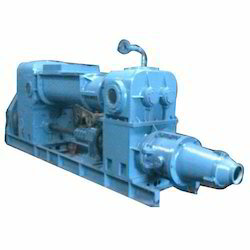 The DE-AIRING PUG MILL machine is driven by a motor through Reduction Gear Box placed behind the Feeding Chamber. All the above mentioned units are placed in Base Frame for easy installation. The materials that has been fed into Feeding Chamber is mixed by the blades and pushed forward into the transition section where the blades are replaced by a single worm which forges the material into the Vacuum Chamber. Before entering into the Vacuum Chamber, the material is allowed to pass through a Screen Plate which forms threads of Clay Mass. In the Vacuum chamber (De-Airing chamber), air is extracted from the material by the Vacuum Unit which is driven by a small separate Motor. 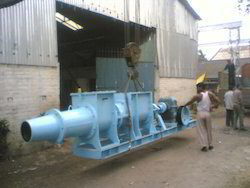 The material is then delivered by an Auger and discharged continuously through the tapered Delivery Mouth. 50 H.P.1440 R.P.M. Sq. Cage. T.E.F.C. Motor. 7.5 H.P.1440 R.P.M. Sq. Cage. T.E.F.C. Motor. Looking for De Airing Pugmill ?